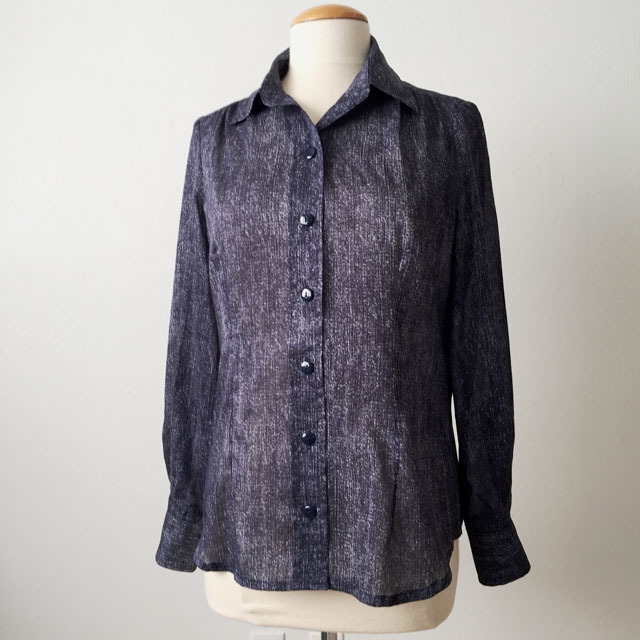 Why do I find sewing button front shirts so satisfying lately? 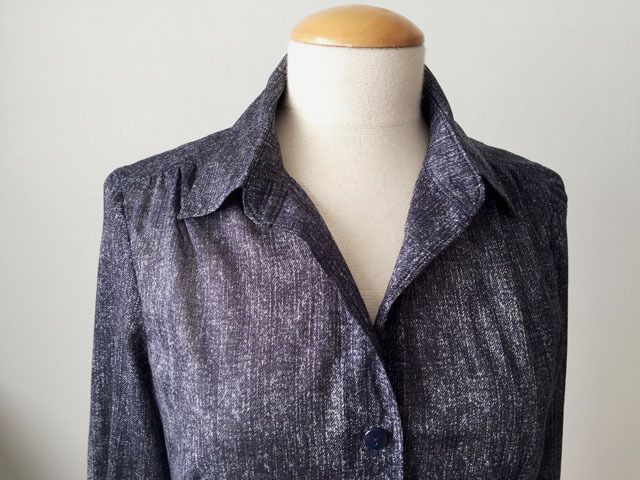 It is a bit curious as basic shirts with a button front and a traditional stand collar are not something that played a large role in my wardrobe in past years. Perhaps they always seemed very serious - a shirt was something to wear with a suit jacket, worn to look serious and businesslike. But in the past few years I have made a lot of shirts and find them really enjoyable to sew. For a basic garment there are countless variations possible and it is fun to change up a pattern without having to start over with the fit. Fun is an understatement - who doesn't love having a pattern that fits perfectly? It is the holy grail of sewing, the TNT pattern (= tried and true). 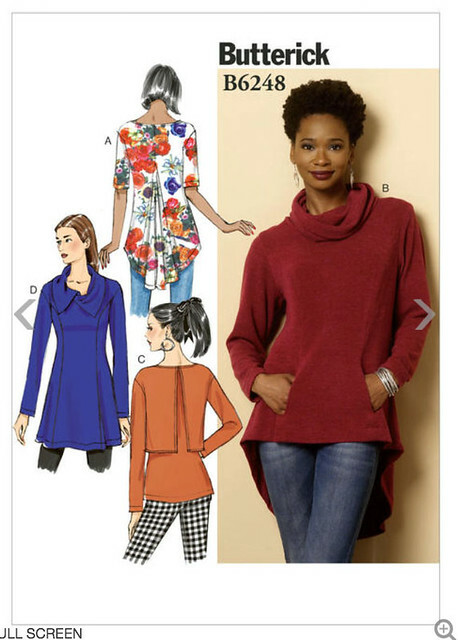 For me it is Simplicity 2339, one of their Amazing Fit patterns that I started using in Dec. 2011. And even then I didn't make it as the pattern was designed. For that version I adapted it to have a hidden buttonhole placket. 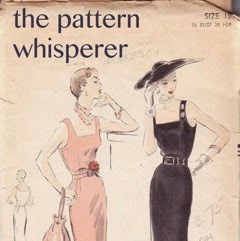 I was off to the races with this pattern, never once sewing it as it was from the pattern envelope. Here is the latest version. As for the fabric, it is divine. A lucky find of this cotton voile at Stone Mountain Fabrics in Berkeley. Their upstairs section is now filled with an assortment of interesting things, a lot of designer roll ends, never the same things on any given week and if you find something that interests you the price is great. It does take a bit of searching - when I was last there I didn't see anything that inspired, and then tucked behind the forest of upright bolts was a skinny cardboard tube with a small amount of this fabric remaining. While it was 54" wide the amount remaining on the bolt was perhaps 1 yard with a very crooked edge giving me maybe another 1/3 yard in a triangular shape. But it was too lovely to pass up so I bought it - for less than $ 3. It is unbelievably soft, slightly sheer, and vaguely denim looking. A perfect companion piece to so many things in my wardrobe. Would you believe that I came home, tossed it in the dryer with a wet towel to shrink and then cut it out later that afternoon? I never do that! But it was a vaguely springlike day and I was feeling ready to jettison the coats and sweaters for a light and floaty cotton shirt. Then I played around with my pattern puzzle pieces until I could just squeeze it onto the yardage available. Now for some info on the front closure. A while ago I copied a shirt for someone and it had a placket (button band) that wasn't sewn on but continuous with the fabric of the front of the shirt. I don't know if this has a name in the trade but I refer to it as the one-piece placket. 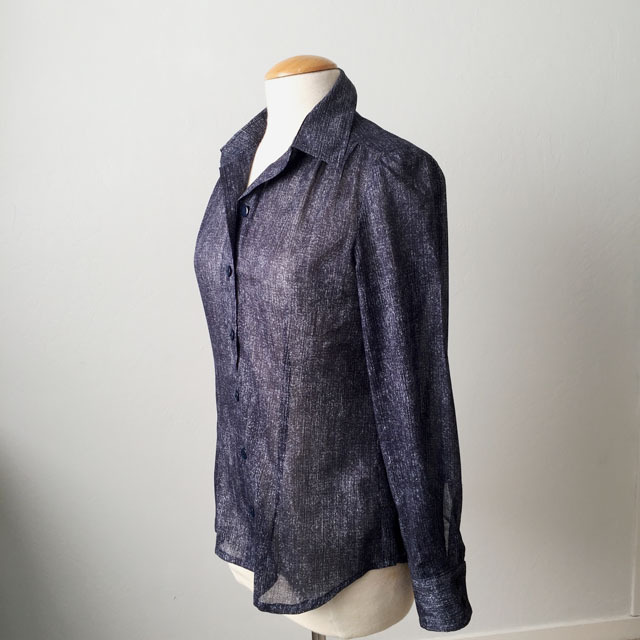 It is slightly difficult to see in this navy blue cotton voile version, so here's a look at it on an older shirt, in cotton poplin. Now for the how-to. 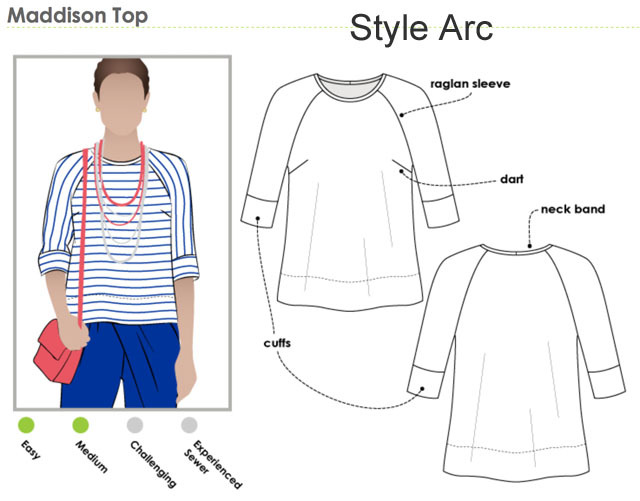 This is a general how-to on creating this - I may have missed some details but I think if you know how to sew shirts and have played around with various placket styles that it will make sense. 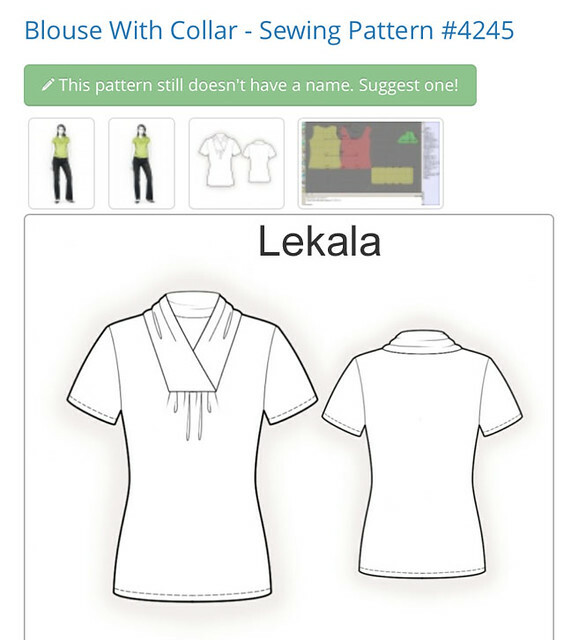 Start with the basic shirt pattern, and the front button band piece. 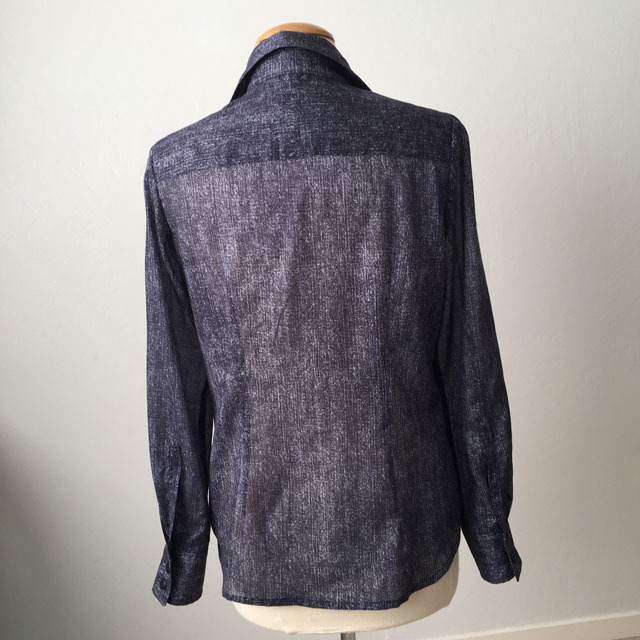 I folded away the seam allowance and overlaid the sewn-on button band to create the dimension of the shirt when completed and the button band is sewn on. Basically you want to see the finished shape of the shirt front where the collar stand is sewn on. Trace this outline, with markings for collar, sleeve etc. I always trace to retain the original pattern for future use. Plus it is easier to mark all over a sheet of blank tracing paper. Here's the traced front shirt (for this example I did it on white paper so I can mark with various colored pens. 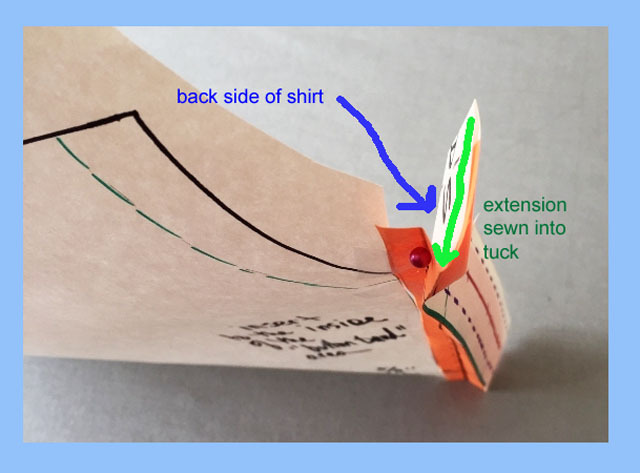 Note that this now includes the center front of the shirt, where the buttonholes will go, but no seam allowances at the center front (don't need them). On the right I have marked 5/8' in from the center front. That inner green line is equivalent to where the seam would be if there was a sewn on button band. Now I create the extra part (Step 3) which turns into a fold that simulates the edge of the button band, and creates a space where the back of this one piece button band tucks in and gets stitched. I have sliced open the pattern on the green line and inserted 5/8" of space. Why 5/8" when I am creating a 1/4" tuck? Trial and error has shown me that even on thin fabrics the turn of the cloth takes up some fabric, maybe less than 1/8" but it is something, and you can adjust the actual width on the other side. 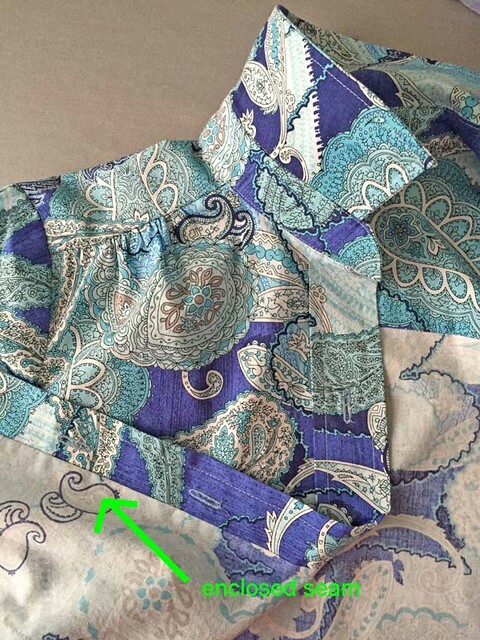 The image on the right shows how this insert gets folded behind what is becoming the all one piece button band. Next I add to the side of the shirt another 1 1/4", or equivalent to the width of the button band if you started with a different width button band. Basically this part has to fold behind the front and reach into the fold created by the inset, and then get stitched in there to make the clean finish. Sometimes I even add a little bit more just to be sure, and then trim it off after folding. In case of a thick fabric, like flannel this would be a good idea. Now the pattern is basically completed, here is the back side of the pattern on the left, showing the extension folded into the tuck (orange paper section). On the right showing the front with the extension folded behind. Also I have marked the stitching that you do on either side of the center front. On the inner side, this serves to catch the extension into the 1/4" tuck, and then stitching the other side 1/4" from the edge gives it symmetry. This is the trickiest part to show, here is a view from a different angle. The extension portion fold back inside, is caught in that 1/4" tuck and if all measurements and folds are correct then you sew the tuck at 1/4" and have a clean finish inside the shirt. What I have not photographed or mentioned is marking and interfacing. 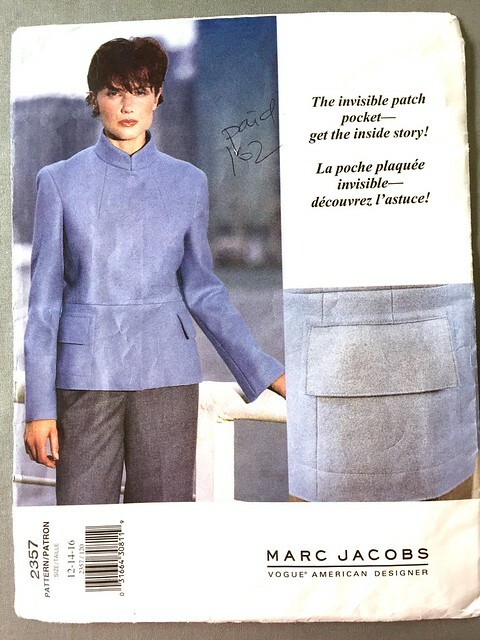 I have this pattern piece created and it is well worn, I mark these lines with tailors tacks and then the folding is very quick. The iron is your friend here, I just press the various lines into the fabric and then open it back out and apply a strip of interfacing to the inside of the extension portion. 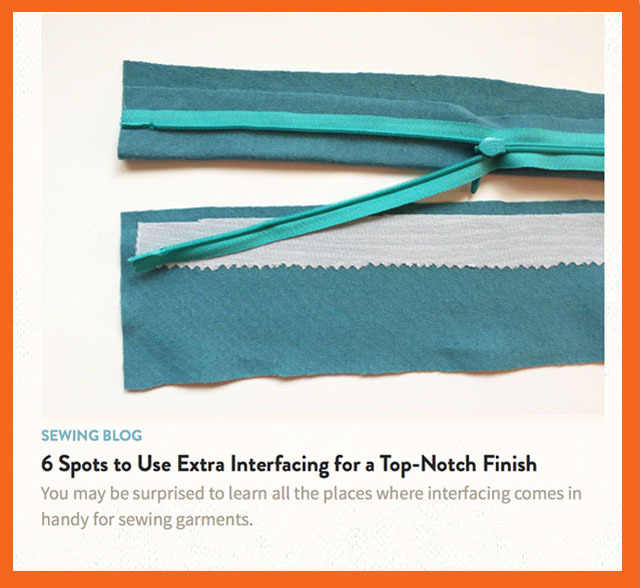 Most fabrics need some interfacing for the buttonholes so don't skip adding this. One last thing to check before actually using the pattern is to make sure the collar stand matches the newly created shirt front. I use a tape measure set on its side to measure curved distances but I couldn't get it to stay still for a photo - so this is my flexible ruler. The portion of the collar stand and the shirt front should still marry up properly after all the folding and tucking. The green lines are equal so all is good. 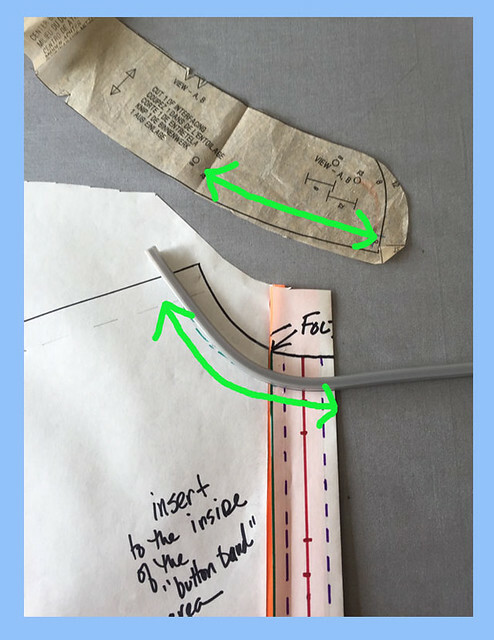 Don't forget when measuring to take away that seam allowance on the front of the collar stand - see how the green arrow doesn't go to the edge of the pattern piece but stops 5/8" from the edge. This is why they do pattern drafting and design with NO seam allowances - so much easier to do all this and then add back when completed. As for the other side of the shirt. I cut out two fronts, a right and left exactly the same. Then I create the one-piece button band on one side. After that is done I overlay the other side on top, fold back the extension to create the same finished dimension as the other side. This will ensure that your center fronts are matching. Then then fold it in again to basically create three layers there and a clean finish on that side as well. The original Liberty shirt I was copying had no stitching on that side and I have continued with that. It looks really pretty and feminine with minimal stitching. One quick backyard photo to show how this shirt looks, although the light was not optimal. But you get the idea. Someone asked me on Instagram about the gathered shoulders. That is a case of rotating the horizontal bust dart into shoulder gathers, I wrote a post on Craftsy a while ago about that. I will have to search around to find that and show it again. And it is great for plaids since the bust dart plays havoc with the pattern for matching. You can see how sheer this fabric is - although not really see-through so kind of the best of both features. Fabric love on this one - and I think it will be able to be worn with so many things. It's a rainy Sunday afternoon here, perfect for staying in and doing some sewing. I had ideas of getting out and pulling weeds but the weather said something different - not that I am complaining, ha ha. The weeds will be there next week. 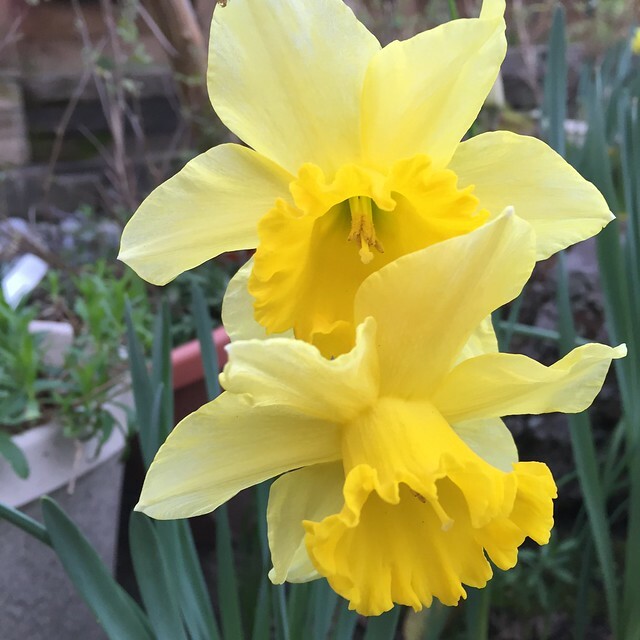 today's garden photo, this time of year what else but daffodils? Recently I have written a few how-to posts for the Craftsy Sewing blog that are worth sharing here. I think you can subscribe to just the sewing portion of the Craftsy blog, although I have to say that some of the baking ones show cakes which are just beautiful and the ideas for cupcakes are adorable. I have learned some great gardening and photography tips as well, so if any of those areas interest you their blog is worth checking out. Anyway - here are links to these recent posts. As always, if you have any suggestions or ideas for a post that I can write please send 'em over, I am all ears. Sometimes I can't think of a thing to write about and then inspiration strikes. I seem to get a lot of my writing ideas at the gym, while pounding away on the elliptical or stair stepper my mind prefers to think about sewing - any distraction will do! Here is one that actually posted today, this blouse in the photo was quite a rush job but I have plans to make a better version soon. 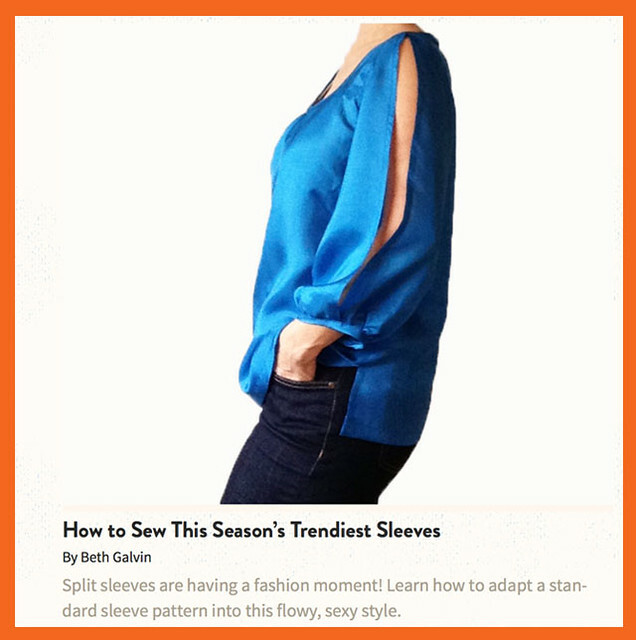 Sleeves are definitely the focus in fashion this year and actually they are a great place to get started with pattern manipulation. 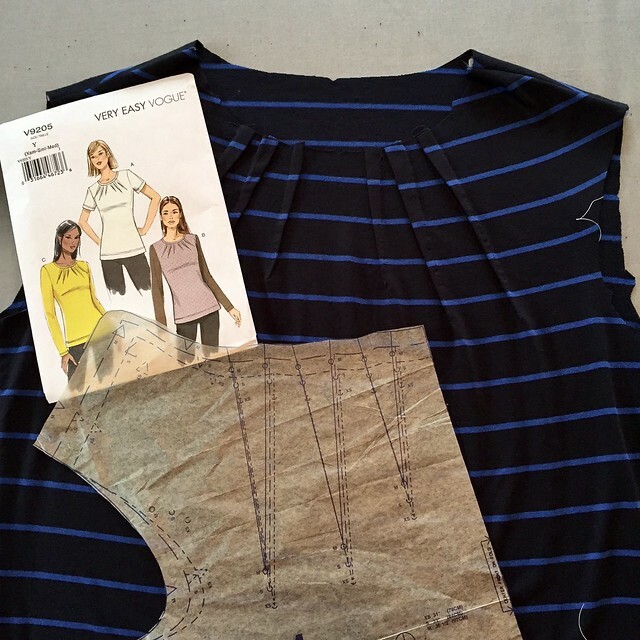 The next post is about interfacing - underscoring my sewing motto: more interfacing! Lastly a post about choosing pattern size, which can be bewildering no matter your level of sewing expertise. 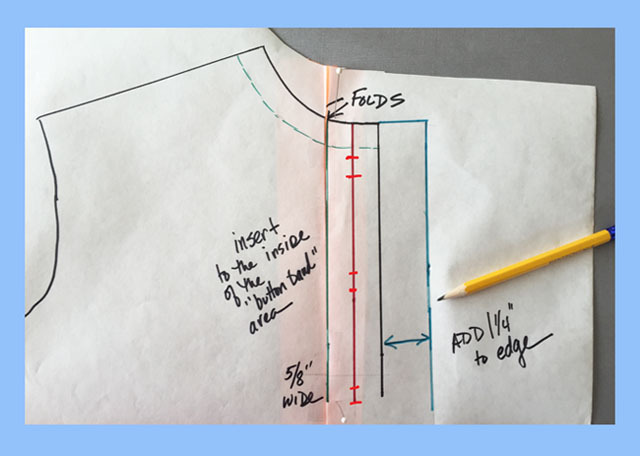 Here's the link to read about how to create the split sleeve. Here's the link to read about using extra interfacing on your garment. 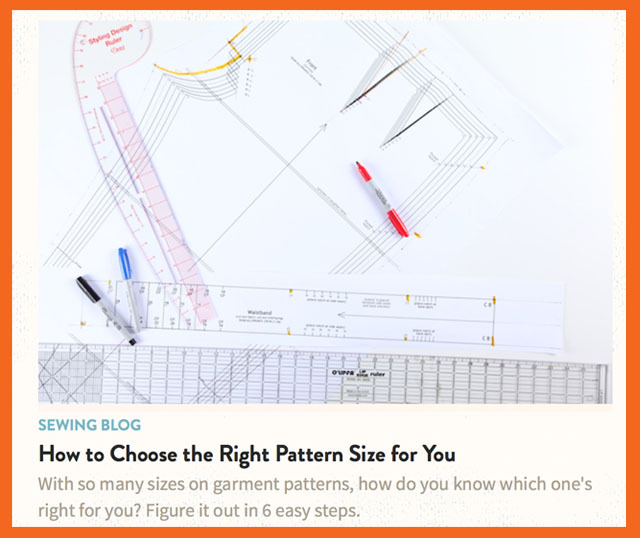 Here's the link to read about choosing your pattern size. This past weekend I attended our Bay Area Sewists meet up which was Frocktails! Super fun evening and a great way to socialize with other sewing fanatics. Plus the handcrafted cocktails were delicious. We all are ready to make it a regular event. A number of people were so nice to tell me that they really like my Craftsy blog posts and have used the info. Very rewarding to hear that - thank you! 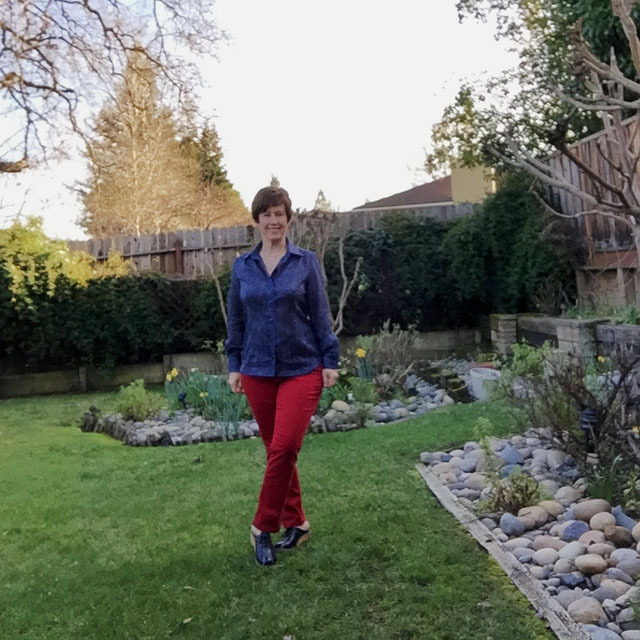 And thanks for all the great comments on my last Pattern Whisperer post about knit tops. Those posts let me "pretend purchase" all kinds of patterns and I probably end up buying fewer patterns overall but do more comparison shopping when I do. 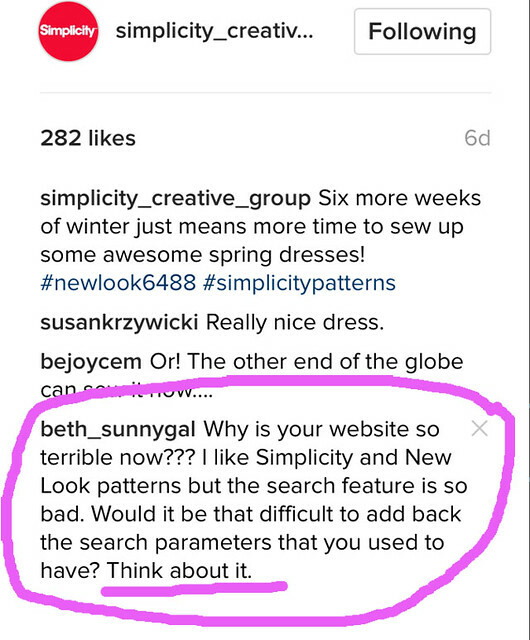 As for Simplicity - I am still annoyed at their website - and while I won't swear off buying them entirely I think they are really missing the boat. Interesting about not being for sale in Canada and some of the potential reasons. I still want to do a Pattern Whisperer on interesting jackets - the next one will probably be on jackets that work with lightweight fabrics for spring/summer. As for sewing, I just started working on tracing a Burda pants pattern so I am giving pants a try again. 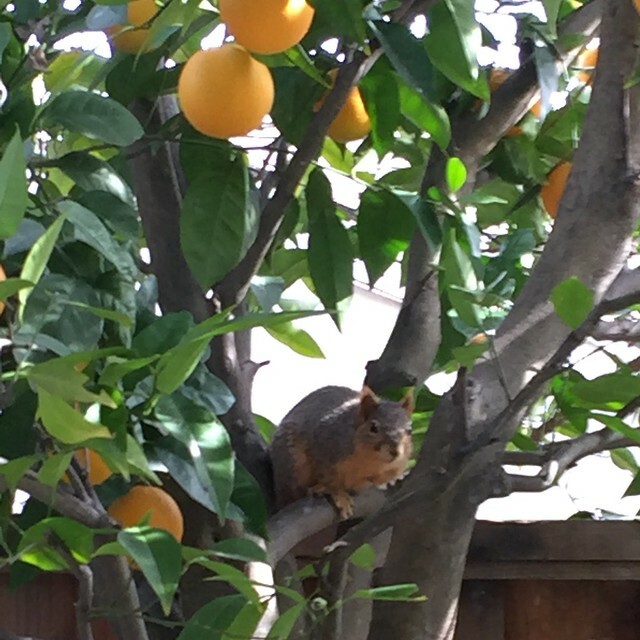 today's garden photo, you may think these guys are cute, but I think they are evil varmints stealing my oranges. And leaving the peels everywhere. Aaaargh. This guy was right outside the window staring me down for what seemed like 5 minutes. Not cool dude. Time for another Pattern Whisperer post, for this the category is interesting knit tops. Recently I had a request to recommend some knit tops and thought it was a good topic. Especially as I was working on a post for jackets but I wasn't really coming up with anything that really grabbed my attention. 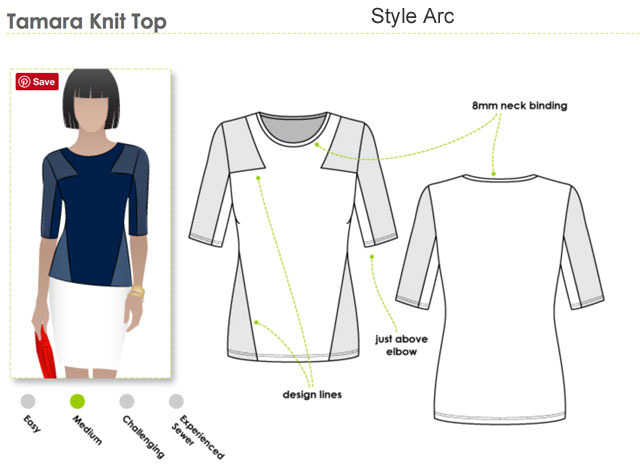 Knit tops are such a rewarding item to sew, as they don't take up loads of time like a jacket or coat, usually can be sewn quite economically, and are forgiving in fit. Plus a knit top can work for so many wardrobe needs, from super casual to elegant to office wear. I even convinced myself to try one of these patterns and have already sewn up two versions since I first noticed the pattern! Let's talk basics first. 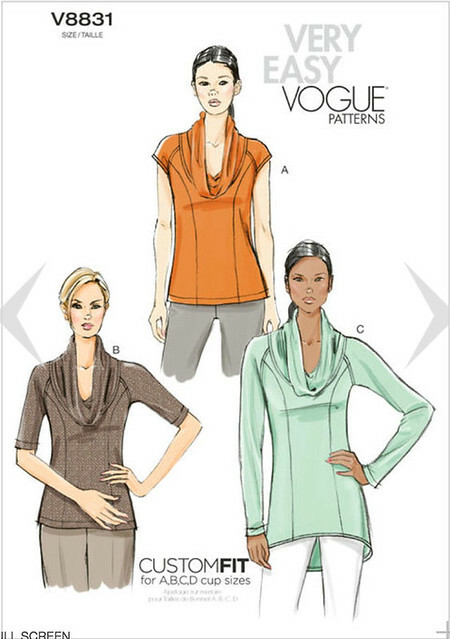 Here are two knit top patterns from Vogue that really suit a variety of body types due to the built in pattern shaping. 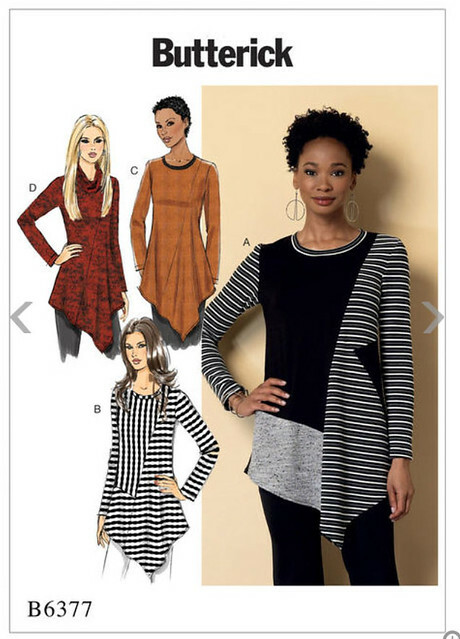 The V1363 on the left is a Sandra Betzina pattern which shows out-of-print on their website today but I could swear it wasn't a few days ago when I was first looking at it. This pattern has bust darts which is great for fitting and I like the contrast neckline option. 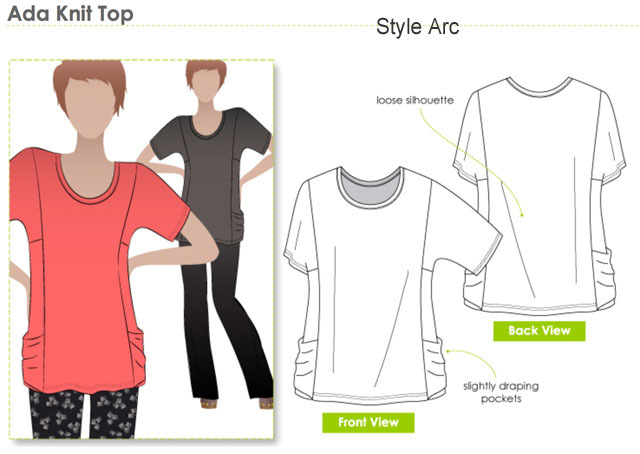 So a versatile basic that you can make in a variety of fabrics. The V8925 on the right has princess seams, which is the other option for getting a really nice fit and this pattern also has a contrast neckline option. 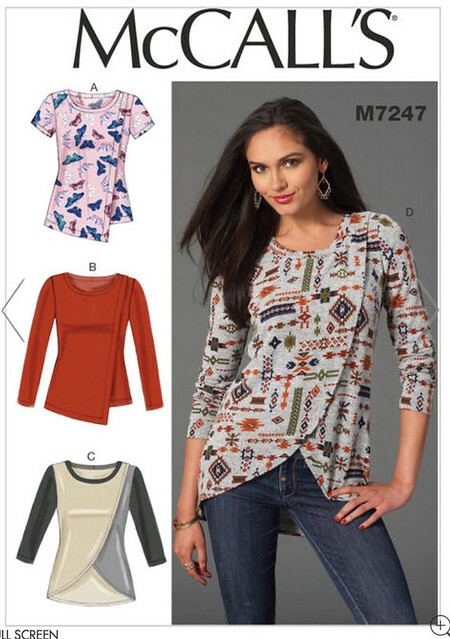 So both patterns have a bit of design and change them up from the ordinary t-shirt style knit top. If you are looking for something with a more cozy feel here is Vogue 8831. 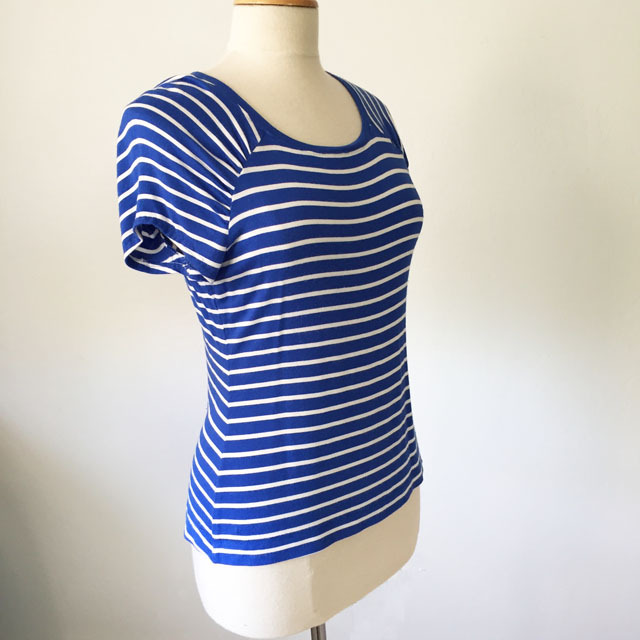 This has the draping neckline which is also seen on the Sewaholic Renfrew pattern (one that I like a lot but feel it has some issues with the armholes/sleeves which are a bit skimpy). This pattern below has a raglan sleeve so really easy to sew, and more princess seams plus cup sizes. Following here's the pattern I just sewed in two versions, V9205 - this might be one of my new go-to knit top patterns. I made the first version in a jersey and it is super comfy, I even used a stripe and it came out well. The second version I made in a very strange fabric I found at a ASG sale - sort of a vintage poly knit, like a ponte but with less stretch. So it is a bit less comfy but I love the colors. And a good choice for my St. Patricks day wear - blog post in March on that version. While the darts are decorative they do create some shaping. It seems like all these patterns I have chosen are suitable for color-block options including this one. Which is very simple but I think it could be lengthened to make a cute dress as well. 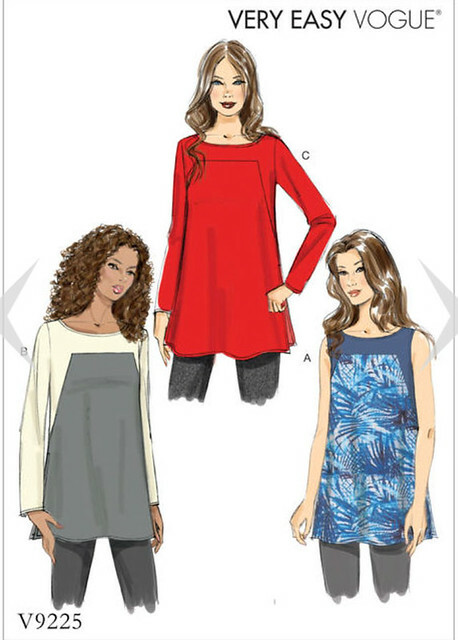 Most of these patterns are also shown as tunic length as well as regular hip length tops which means they will provide the yardage for that option which is nice if you want the tunic style. 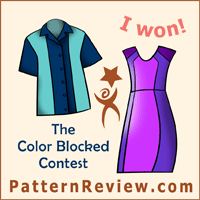 Another one that has quite a few variations in the pattern envelope is Butterick 6248. You know I love a pattern that has lots of variations in one pattern envelope - it appeals to my thrifty side plus you actually have more patterns with less storage. Pockets, interesting back view, cozy cowl neck. I don't think I would be comfortable a top with that long back but some people carry off this very well. Here's one with interesting seaming, I really like the one with the stripes and solid black and grey fabric. This one is not super interesting but if you like this draped neckline and want fit guidance then I think these Palmer and Pletsch patterns are quite clever. 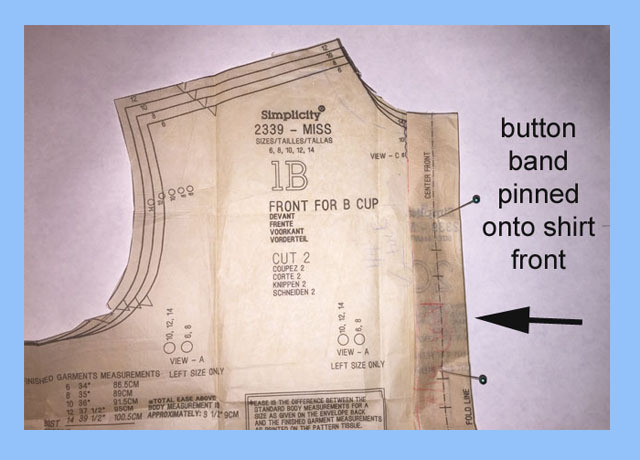 The adjustment lines are printed on the pattern pieces and they include instructions on full bust adjustments, swayback, sleeve etc. This one is McCalls 6963. While this one doesn't have a lot of options in the pattern envelope it's kind of cute with the interesting asymmetrical front. 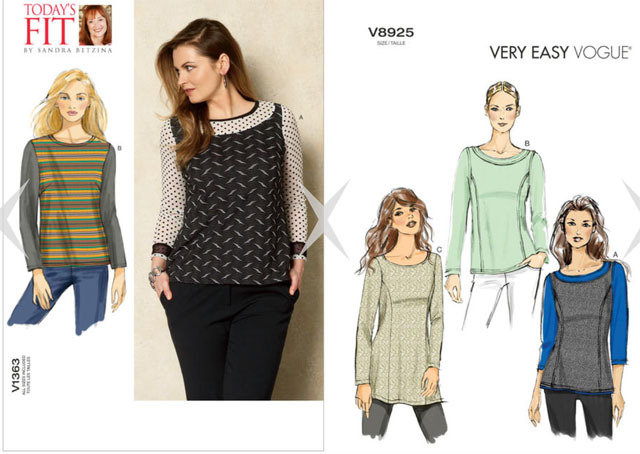 Moving on to other pattern companies - Style Arc has a LOT of really interesting knit tops. I haven't sewn a lot of them but I have friends that love these patterns. I am always tempted but haven't made any. Here are a few that caught my eye. 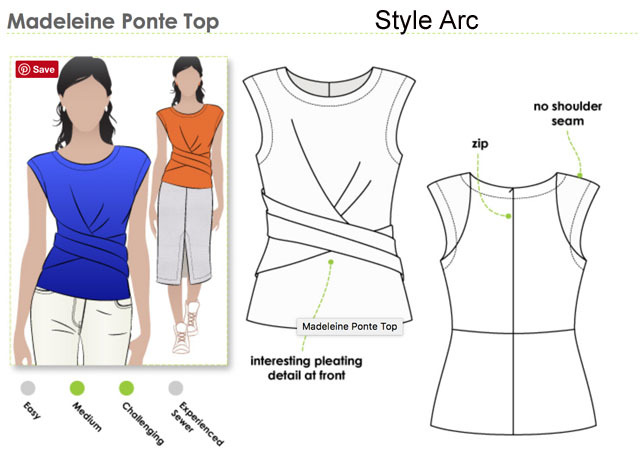 I really love this last one, if you sew this Madeleine Ponte top and with a pencil skirt in the same fabric it would be a super sharp work look that would give you the appearance of a dress with the versatility of separates. 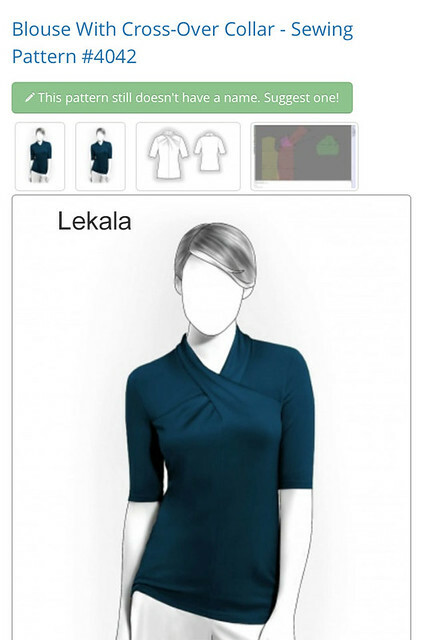 For a more fitted type of knit top Lekala has some really interesting options. I have made this one in the past and it came out perfectly. Of all the things I have tried from Lekala the knits have been by far the best which is kind of interesting. Here's the post to see my versions of this top. Here's another one I like a lot - you can see that a lot of the knit tops I sew don't have round necklines, I am always chilly and the spot I feel it the most is the back of my neck. So I tend to choose these patterns that have a collar or turtleneck when sewing for myself. I downloaded this pattern but I can't remember if I sewed it. I'll have to search in the pattern drawer to find it. As for other patterns - there is this Burda pattern I sewed in the fall and I really love it. Which is Burda 02-2013-126. I also like this McCalls 7046, post here. My favorite plain raglan t-shirt, Burda 6990. My absolute favorite New Look wrap front knit top, New Look 6150. Another wrap front top, McCalls 6513, here and here plus other versions. Another pattern company I want to mention is Jalie. They have lots of knit tops, and I think their patterns are the best value of all as they contain all sizes in one envelope. So a pattern for a knit top will have multiple view and contain sizes from small kids to adult. You have to trace the patterns but the paper is really thick and the printing is easy to trace. I have used their basic t-shirt as a starting point for a variety of knit tops. Here's a sneak peek on that Vogue pattern with the radiating darts that I mentioned above. As always I tend to stick to the big 4 or 5 pattern companies for my picks - since I find the limitations of indie patterns not as appealing (fewer options in the patterns, higher price, etc. although I know they are a good option in Europe and Australia.). But if you have any great patterns to recommend feel free to add them. Up next more shirts completed. And even a how-to in the works on doing a one piece shirt placket plus changing darts to gathers. Tomorrow is a serious garden clean-up day - wow this rain is fantastic but the weeds are taking advantage of it too! today's garden photo, this one was taken a few years ago but the exact same plant is blooming right now, by the front door. 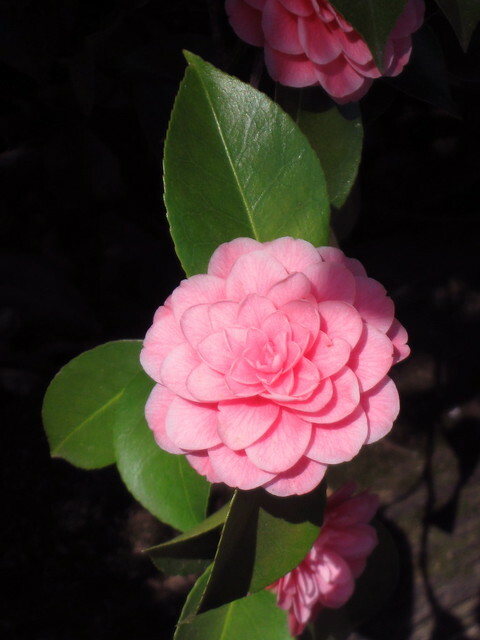 Camellias are so pretty but the blooms drop quickly and make a mess. But I just can't bring myself to change them out.